Jaclyn Jose brought honors to our country when she bagged the Best Actress trophy at the 69th Cannes Film Festival in France last month for the movie Ma' Rosa. 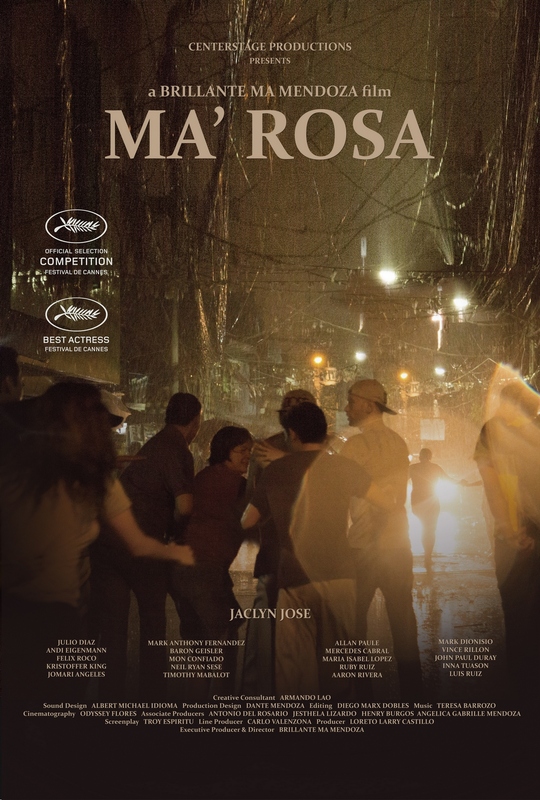 Ma' Rosa is a drama/action film directed by Brillante Mendoza. It also stars Julio Diaz, Andi Eigenmann, Felix Roco, Mark Anthony Fernandez, Baron Geisler and Ma. Isabel Lopez. ROSA owns a small community convenient store connected to their home in the slums of Metropolitan Manila. Together with her husband, NESTOR, they use their convenient store as cover-up for selling illegal narcotic, Methamphetamines. their fate changes one Saturday night when their neighbor BONG-BONG, who works as a fly-by-night parking attendant, begs her to sell him a small pack of Methamphetamine without knowing that it’s a ploy for a pending buy-bust operation leading to Rosa and Nestor’s warrantless arrest by a police team led by Sergeant CASTOR. The policemen command Rosa to rat-out their source of illegal narcotics as trade-off to their freedom. Hesitant, she has no choice but to call JOMAR, and cooperate with the policemen. But despite latter’s arrest, the policemen inform Rosa and Nestor that they still need to pay 50,000 pesos for their freedom. Backed against the wall, Rosa seeks help from her children, JACKSON, RAQUEL and KERWIN as they do the unthinkable. Jackson sells all their appliances while Raquel painstakingly borrows money from their poor relatives. On the other hand, Kerwin sells his body to his gay benefactor – all of these just to buy the freedom of their parents. Indeed, Ma' Rosa is a must see Filipino-produced world class film. It will premiere in Philippines this July 6. Ma' Rosa is released by Centerstage Productions thru Solar Pictures.